Hey there readers, I want to say thanks for the many responses I got from you – mostly only those of you still alive and not angry at me for you getting knocked out of your survivor pool! – and, thus, I will do a survivor story for the first two weekends of the NFL playoffs when there are four games each weekend. Now, some of you said your format changes come playoff time. Some pools use the playoffs as the tiebreaker for any players still standing after Week 17 and simply reset the 12-team playoff field. Some start completely over with a re-buy. Some only reward those who pick the correct team to win the Super Bowl before the playoffs begin. There’s obviously no way I can project how yours works, but I will at least include the spreads in the four game previews the next two weeks because often the spreads do come into play in postseason NFL survivor pool picks. Houston Texans (-3) vs. Cincinnati Bengals: I hate this game for Houston, which won, 20-19, at Cincinnati in Week 14. Does anyone think that a team in its first-ever playoff game can simply flip the script after ending the regular season with three straight losses (all three to non-playoff teams and two at home)? If I asked you right now which duo you would chose this week to start, Texans QB T.J. Yates and WR Andre Johnson or Bengals QB Andy Dalton and WR A.J. Green, wouldn’t you have to lean Cincinnati? The rookie Yates will start after leaving the Week 17 loss early, but he hasn’t thrown a touchdown pass since that first meeting with Cincinnati. Johnson will play but only 40-50 snaps as he tries to avoid injuring his tender hamstrings again. He missed the first Bengals game. New Orleans Saints (-10.5) vs. Detroit Lions: If this game isn’t the highest-scoring matchup of the weekend, I will write next week’s column dressed as a kangaroo (maybe I do that anyway). Of course, New Orleans has the NFL’s top offense behind record-setting QB Drew Brees and has scored less than 30 points at home this season just once, going 8-0 there. The Saints beat these Lions in New Orleans, 31-17, in Week 13 (the Lions were without suspended defensive star Ndaumkong Suh). 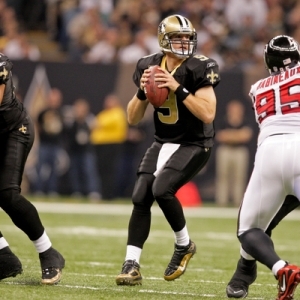 Brees had 342 yards and three scores, while the Lions’ Matthew Stafford had 400 yards. This is the first time two 5,000-yard passers will have faced off in the postseason. I do think Stafford and the Lions will score plenty and keep this relatively close, but Brees and Co. are too playoff-tested to lose, while this is the first postseason for the Lions since 1999. New York Giants (-3) vs. Atlanta Falcons: In my mind this is the hardest game of the weekend to pick because the Giants can look like a Super Bowl team one week and then take a steaming … well, they are inconsistent let’s say. The Falcons, however, usually aren’t the same team out in the elements and the weather forecast calls for about 40 degrees and rain/snow showers for this one. I think the G-Men harass Matt Ryan all day as New York in the last two weeks has 11 sacks, 13 quarterback hits and three interceptions. Yet a 41-20 Falcons win wouldn’t shock me, either. Tom Coughlin saved his job by getting in the playoffs, but if Giants roll over here, he’s gone. Pittsburgh Steelers (-9) at Denver Broncos: The only worse matchup for the Denver Tebows probably would have been the Baltimore Ravens. Pittsburgh has the No. 1 defense in the NFL and the Broncos’ offense has gone south right along with Tebow, who has one game with a QB rating over 69 in his past four. The Broncos won only one of those, and that was a miracle comeback against Chicago. The only team that Denver scored more than 14 points against in those four games was the Patriots, who have the NFL’s worst defense. The Broncos won’t be able to run on Pittsburgh (No. 8 vs. run), which won’t have stud safety Ryan Clark but will have linebacker LaMarr Woodley, and we all know that Tebow won’t be able to pass against the NFL’s No. 1 pass defense. In their past five wins, the Steelers have allowed a total of 25 points. *-The Saints are invincible at home and will win, but I wouldn’t give 10.5 points if spreads are an option. Plus, this is likely their final home game of season so probably final time worth picking the Saints (unless they reach the Super Bowl and that Indianapolis dome). *-The Steelers are simply better than Broncos and should win, but I wouldn’t give the nine points. *-Giants win by a touchdown. *-Bengals pull the upset. Almost always a road team wins on wild-card weekend so this is the choice. If you have to take a Super Bowl pick before the playoffs, I am going Baltimore. Strike Point Sports has brought his NFL picks clients more than $5,400 in profit this season and he loves the odds for this weekend’s wild card games. His NFL handicapping should produce more great results this weekend and a one-week package is only $99! Click Here.